Imagine warm and delicious figs wrapped in Prosciutto di Parma. No, you’re not dreaming. Prosciutto di Parma helps enhance the sweetness of any winter fruit and here it blends harmoniously with the sharp gusto of Gorgonzola. 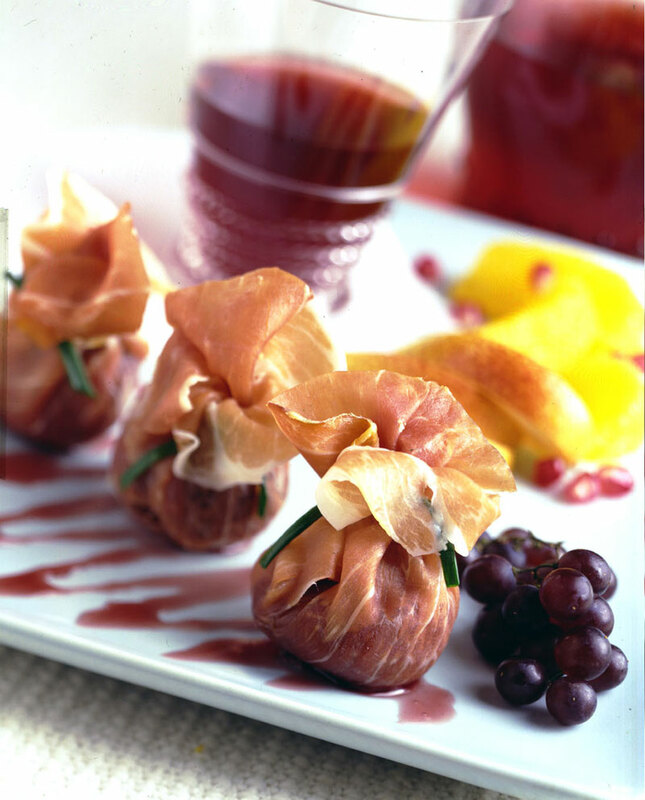 These prosciutto wrapped fig pouches create that special treat that’s completely worth the effort. Not to mention, how adorable these sweet prosciutto wrapped fig morsels actually look. Handle with care and enjoy! In a small saucepan, bring wine to a boil. Add figs; simmer, covered, until figs are tender, about 5 minutes. Remove figs and reserve. To the wine remaining in the saucepan add sugar; simmer until reduced to 1/4 cup; remove from heat and reserve for later use. Fold each prosciutto slice in half to make 4 1/2 x 4-inch rectangles. Remove stems from figs. Cut a cross in the top of each fig. Place a piece of Gorgonzola in each cross, pressing slightly. Place a stuffed fig in the center of each prosciutto rectangle. Fold prosciutto up and around fig to make a pouch. Tie with a chive. Repeat with remaining ingredients. To serve, arrange 3 prosciutto pouches on a serving plate. Drizzle plate with wine reduction. Garnish with fruits.